Explanation: What happens when a star runs out of nuclear fuel? 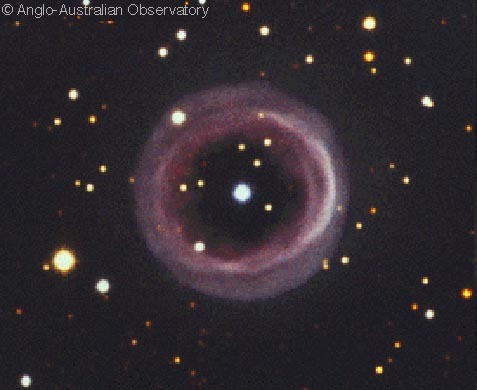 The center condenses into a white dwarf while the outer atmospheric layers are expelled into space and appear as a planetary nebula. This particular planetary nebula, designated Shapley 1 after the famous astronomer Harlow Shapley, has a very apparent annular ring like structure. Although some of these nebulae appear like planets on the sky (hence their name), they actually surround stars far outside our Solar System. Tomorrow's picture: Water on Mars?